Mansfield Town winger Matty Blair is convinced his brother's diagnosis with a brain tumour has helped him become a better person and footballer. Ross Blair has been fighting the illness since last year and it quickly made Matt realise his on-pitch problems and injury issues were insignificant. He told BBC Radio Nottingham: "Football isn't everything; family comes first. "I had an attitude of so what? I know it might not sound right but not playing was 'whatever, it's cool'." 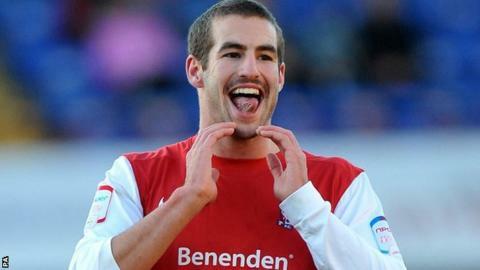 Matt, 26, was out of favour at previous club Fleetwood Town and joined the Stags in January this year. But he played just three games for his new club when he suffered cruciate knee ligament damage and has not played since. Blair is back in training and hopes to be ready to return by the end of September. And Ross is also "doing well". "He was diagnosed in February 2014," Matt added. "Since then he has undergone radio and chemotherapy. "Two to three weeks ago he had an MRI scan and a consultant meeting and it was said that the chemo is containing what is left of the tumour, which is probably the best news we could get. "He'll get scanned every couple of months to make sure this is the case. Hopefully it will stay like that and he will live a long and happy life. "I had an operation and thought nothing of it because when he had his operation, he never complained once and never has complained about his situation." Matt said the time spent with his family following his diagnosis gave him a much better outlook on life. He said: "I had a couple of weeks off at home looking after the family with everyone trying to gather around, make sure we were there for each other and support him and his family as much as we could. "When I went back to Fleetwood I had that attitude of so what. It made me a better player and probably a better person as well." But the frustrations he felt at Fleetwood are now behind him too. He explained: "I didn't think I would get a chance - that's why I came here, to live back in Coventry where I am from and get back to enjoying playing football again. "My brother loves coming to watch and I hope he can come and have a couple of games to get his love back and see his little brother. "It's the best job in the world. The highs are unbelievable. I am dead excited now. "I have effectively had six months off, watching and getting frustrated thinking 'could I have done better?'. "I am desperate to get back out on the pitch."